The recent reforms to GCSEs and A levels in England were the biggest in a generation. The new qualifications have been introduced in phases, with the first awarded to students in 2017. This summer is a major milestone in the reform process because the qualifications awarded to students in all but a few subjects will be new. Mostly they will take new GCSE, AS or A levels, with updated content and revised assessments designed to better prepare them for their next phase of study or work. The vast majority of the A levels they take this year will have been assessed at the end of their course – unlike in previous years, students will not have sat AS qualifications that count towards their A level grade. Almost all GCSE students this year will have only numbered grades on their certificates (rather than a mix) – all the grades they achieve will be on the 9 to 1 scale. Those that took the first of the new 9 to 1 GCSEs (in English language, English literature and mathematics) in 2017 will by this summer have completed a further two years of study at school, college or as part of an apprenticeship. This means most will be moving on to work or to further study, so university and college admissions tutors and employers will have already started to see the new grades on applicants’ CVs. Our perceptions survey tells us that understanding of the new grades amongst universities and employers is good, and we will continue with our work to remind them that from now on they should expect to see large numbers of students applying to them with the new GCSE grades and how they relate to those in the previous qualifications. 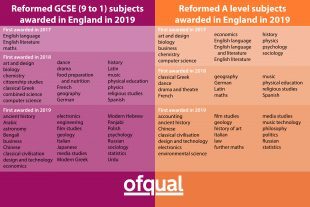 We will also be reminding universities and employers that the GCSE, AS and A levels that are taken across England, Wales and Northern Ireland are now different from each other in almost all subjects too. Working with the qualifications regulators in Wales and Northern Ireland, we have produced a statement that gives an overview of the main similarities and differences between the qualifications and sets out how those that rely on these qualifications can make broad comparisons between them. Our graphic lists all the qualifications that are being awarded for the first time this summer. A small number of reformed foreign language qualifications (which are taken by very few students) will be awarded next year, when the entire process will be complete. As has been the case as all the new GCSEs and A levels have been introduced, we will make sure that exam boards carry forward grading standards established in the old qualifications to the new ones when they are first awarded. We expect them to rely heavily on statistical evidence to do this, using the expertise of their senior examiners to check if the grade boundaries that the statistics indicate are appropriate. In the new A levels, this means that, provided the 18-year-old cohort taking a particular qualification is similar to that of previous years in terms of their GCSE results, national results in the subject in 2018 will look similar to results in 2017 in that subject. In the new 9 to 1 GCSEs, exam boards will use predictions to anchor standards to the legacy A* to G GCSEs. This means that, if the 16-year-old cohort taking a particular qualification is similar to that of previous years in terms of their key stage 2 attainment, the proportion of students who achieve grade 4 and above in that subject will be similar to the proportion that previously achieved grade C and above. The same principle applies to grade 7/grade A and grade 1/grade G.
If you would like to talk to Ofqual about any of the issues raised in this blog, please contact us at public.enquiries@ofqual.gov.uk. My understanding is some Unis and indeed XI th form colleges are asking for Level 5 in GCSE maths and English.